I had the huge privilege of spending several weeks at Laura’s house this last summer. I got to sit in her kitchen and watch her prepare meals, plan menus, and try new recipes. I truly wish every one of you could do the same…mostly because hanging out with Laura is a joy, but also because watching her do what she does? It’s inspiring! By the end of our trip, I knew I could make some simple changes that would have a HUGE impact. It’s not like I haven’t been reading Laura’s posts for, well, forever, or that I didn’t “know” the information in my head… but sitting and watching (and eating the food) made such a difference in how I felt about making important changes. 1. Laura really DOES have a hard time talking and cooking at the same time. She and my daughter made muffins together, but they were not quite as fluffy as they were originally supposed to be because they left something out. We were talking, the boys were in and out of the kitchen (I have two boys, to add to Laura’s four, so it was BUSY), and Martha was “helping.”Ok.. ok.. ANYONE would have a hard time getting a recipe correct under those circumstances. 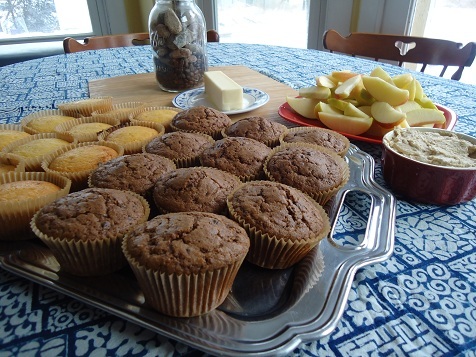 But it really did turn out just fine, because the muffins were still yummy – just not airy. 2. Whole, REAL food tastes better than anything you could ever get at a restaurant. My family typically eats “out” a LOT. I promise you that the food we ate at Laura’s house was nourishing, yummy, and so much better for us than what we eat when we go out. My children loved it. They were anxious for meal times to see what Miss Laura was going to prepare. They tried a LOT of new things, and most everything was a big hit. My personal favorite? It’s hard to choose because everything was so, so good, but Laura’s Thousand Island Dressing is to die for. I would eat salad at every meal (well, maybe not breakfast), just to get more of this dressing. I am not much of a “dipper”, but I would dip any veggie in this stuff and sigh with happiness. 3. Every meal we ate at Laura’s house (EVERY meal!) 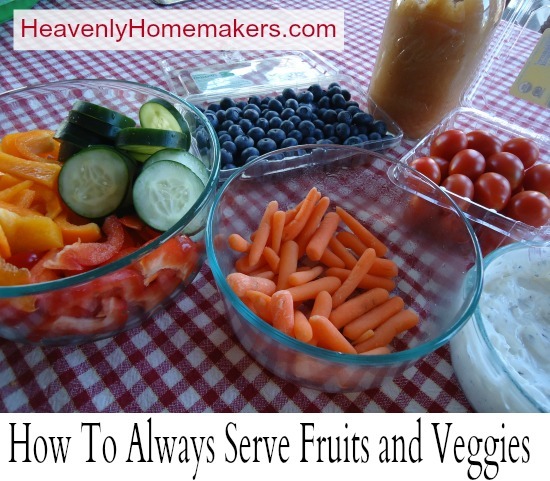 included raw fruits and veggies. My kids LOVED this! Blueberries, strawberries, cantaloupe, oranges in the morning for breakfast… all those and apple slices, carrot sticks, broccoli, and more for lunch and dinner. None of it needed to be cooked to be eaten, and it’s SO EASY. Need to add more fruits and veggies to your meals? Go raw! 4. Butter really IS our friend. (Read more about this here.) Butter makes everything taste better. Put down the margarine and don’t ever use it again. Really. (I actually already knew this before our visit, but it’s so important, and the food prepared with butter was SO good, it bears repeating in my list). 5. A plan is a good thing. I’m a list maker in my business and keeping track of kids’ activities, but for some reason I often don’t take the time to plan menus or make thought-out grocery lists. My goal for 2014 is to change that, because it just makes life easier and more organized if you have a menu and a list. I want to work towards never again asking the question at 5 p.m., “What are we going to eat tonight”?? And, really – we don’t have to work that hard. Laura has tons of menus already pre-done. Ok, that’s a resolution I can take off my list. Just download Laura’s menus, and hit the store running. And if you were to visit her kitchen, you’d see that Laura has her weekly menu up on the fridge, so she can look at it any time and see what her plan is, or revise her plan based on last-minute changes in daily life. 6. It’s not complicated. It’s really not. Laura is a master at making wholesome food for her family (and friends), and doing it quickly and easily. It’s her passion, and she’s GOOD at it. But, don’t be intimidated. This really was the most important lesson I took away from the few weeks sitting at her feet. You and I can do this too, because it’s just really not that hard. Our family is busy. Crazy busy. Three kids, school projects, karate, dance classes, home-based business (or two). We eat on the fly a lot, often making poor choices because of poor planning, and a mistaken idea that it’s “too hard” or too much work to fix healthy, real food meals for my family. But, if I make a few changes here and there? I can do this! When I am making a casserole – I will make two, so I always have a back-up in the freezer. Need a salad to go with the meal? Cut up some lettuce and put it in a bowl (bonus points if I cut up a tomato too!). Prepare a ton of the Thousand Island Dressing ahead of time, so I can have it with my lettuce in a bowl. Buy a bunch of raw fruits and veggies every week, wash them, cut them, prepare them all at once, and then pull them out at EVERY meal. Make a plan. Make a grocery list, and stick with it. Get my kids to help with easy prep work (like fruits and veggies prep, so they have healthy snacks on the go). Seriously – such simple changes that will make a HUGE difference, and if *I* can do it, so can you! My family has been enjoying the Butterscotch Bars the past few days. YUM! So easy, and so good! I’d love to come watch you in action someday! We used to go right thru your town on our way from OKC to my husband’s parents’ house in Laurel, NE. I loved going thru there because my (then) 1 year old would be distracted by the colorful water tower for at least a few minutes. :) Now we live in CO Springs and go NEAR it when we travel, and I always think of you when we do. Maybe one day we’ll have to take a detour. :) I was so disappointed that we were out of town when you came to CO in May.